Box office success of films about children and/or young adults with extra special skills or abilities has brought in the big bucks for filmmakers even when the movies weren’t very good. THE HUNGER GAMES, DIVERGENT and the painfully acted TWILIGHT series all managed strong followings that seem to encourage making more movies about youngsters on the run from evil forces while managing to fall in love during all the turmoil. 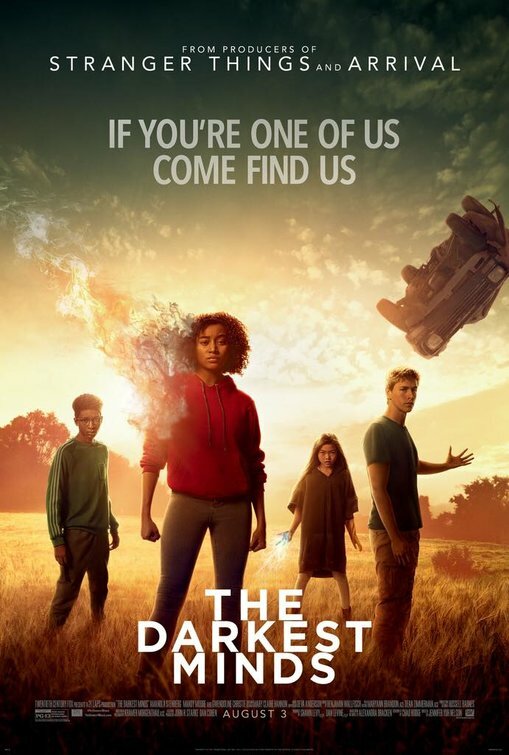 Director Jennifer Yuh Nelson is throwing her hat into the ring by bringing audiences THE DARKEST MINDS, a novel by Alexandra Bracken, to the big screen. Will this new big screen adventure be able to cash in on the popular trend or just wind up as a bad investment? Ruby (Amanda Stenberg) sets the ground work for the story through a narrative explaining that children all over the world are inflicted with a deadly disease called IAAN. Most children contracting IAAN died but those few that survived mutated into beings with varying degrees of special powers. The government, fearful of children they could not understand, takes them from their parents and place them in detention centers (sound familiar?). The children are then categorized by color according to their special skill sets. A child falling into either an orange or red category is considered extremely dangerous and immediately terminated. Ruby, who it turns out is an orange, manages to figure out how to outsmart authorities and stay alive. Ruby spends the next 6 years of her life as a prisoner in one of the centers that is primed for child abuse. Then in what she considers a lucky break, Ruby meets Cate (Mandy Moore) a kind doctor who frees her and wants her to join a group called The Children’s League. The doctor convinces the teenage girl that the League is a safe place for kids but soon Ruby starts to have doubts on the doctor’s true intentions. Quickly losing faith in her rescuer’s motives Ruby runs away and connects with Liam (Harris Dickinson) a handsome telekinetic, Zu (Miya Cech), who surges electricity and Chubs (Skylan Brooks) with his extraordinary high IQ. After escaping a dangerous bounty hunter, the foursome form a strong bond of friendship and set out on a journey to reach a camp run by a mysterious leader known as The Slip Kid (Patrick Gibson). Turns out, the mysterious camp leader’s name is Clancy Gray, son of the current president, President Gray (Bradley Whitford). Clancy underwent several medical procedures in an effort to cure him of IAAN. Clancy manages to convince his father and medical doctors he is cured of the disease but he is hiding his abilities as a he builds a haven for others like him. His mission is to show Ruby and her friends that his utopia will keep them safe. Ruby settles into her new surroundings as she tries to make peace with her past and finds that she is falling in love with Liam. There are lots of points that don’t make sense in this film. The juveniles held in camps for years and receiving no education seem to know a lot about a pop culture that they were never exposed to and seem awfully articulate considering they may never have gone to school. Ruby seems very well balanced for a child that was subjected to abuse and it doesn’t seem realistic that she wouldn’t suffer from some trauma after years in confinement. A parent just giving up their kids without a fight doesn’t make for a very convincing storyline. The adult cast is pretty much useless in the movie not because they are bad actors but because there is no character development or screen time for any of them. Gwendoline Christie, known for her stellar performance in the popular HBO series Game of Thrones, plays a bounty hunter. So much more could have done with her character to create some depth to the villainous role she was playing. Instead, Christie is just shuffled off (in a somewhat comical fashion) after only one scene. Mandy Moore barely has time to connect with the audience and is taken out of the picture for more than two thirds of the movie and when her character finally reappears we still really don’t know what the character is all about. Amanda Stenberg gives a warming portrayal of a conflicted heroine that audiences can root for and Harris Dickinson is likable as an honorable young man fighting for justice. The romance between Stenberg and Dickinson’s characters actually manages to spark some interest but still does not come close to the chemistry that Shailene Woodley and Theo James had in the DIVERGENT Series. The villains in this story are very one dimensional adding little interest to their characters.